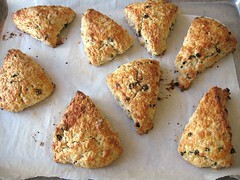 Cinnamon-Currant Oatmeal Scones - Do You Know The Muffin Man? Notes: Yes, it's a repeat. My fridge is being replaced this weekend and I had some 10% cream to use up. Also, the butter had been sitting out for a couple of hours but I decided to use it in that state anyway: I smeared it into the oat-flour mixture. This variation is also a winner, just enough sweetness (sugar) and warmth (cinnamon).